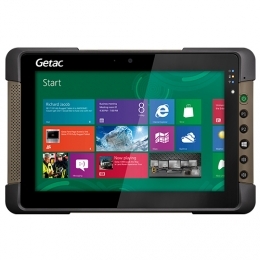 Finally a compact tablet PC that truly deserves its name The Getac T800 is not just a simple tool outside of the office it is powerful enough to be the office Windows 10 is pre-installed and, featuring an Intel Atom x7-Z8700 processor, the T800 is equipped for maximum performance - it is ideally suited for field staff in utilities, maintenance and on construction sites. Add to this up to 4 GB DDR3 RAM, an Intel HD graphics VGA controller and an SSD with 32, 64 or 128 GB - performance and memory capacity are covered. The completely robust T800 tablet fits ergonomically in one hand, is only 24 mm thick and weighs less than one kilogramme. With its multi-touch display 20.6 cm screen size, resolution of 1,280 x 800 it optimally meets requirements for mobile work environments. Thanks to the bright 600 Nits and Getacs LumiBond technology, it is also easily readable outdoors, even in bright sunlight. The six tablet function keys simplify handling for users, offer quick access to frequently used application and ensure for smooth operation. Neither extreme temperatures, drops, vibration nor liquids are able to negatively influence the MIL-STD-810G and IP65-certified tablet. The enhanced housing design and ATEX certification zone 2/22 of the T800-Ex ensures safe operation even in highly explosive environments, thus protecting users. The standard battery lasts up to 8 hours thanks to Getacs integrated LifeSupport technology, make battery changes during operation for uninterrupted work. The unique SnapBack batteries allow users to work without having to close applications beforehand or shut down the system. According to the application expand the functionality of the T800 for maximum flexibility expand the tablet PC to include either a 1D/2D scanner, MicroSD slot, RS232 or Ethernet port. The T800 easily joins together multiple devices and functions to maximize on-site productivity - at every location. For more security during operation there is a 2-in-1 RFID/smart card and smart card/magnetic stripe reader at your disposal. Connect it as easily as the SnapBack spare battery - quickly and easily without any tools. The integrated front HD webcam simplifies the execution of image-supported processes, such as video support or video conferencing. The T800 also features an 8 megapixel rear camera. This way you are able to document construction progress, defects, damages, etc. as well as make high resolution facility and terrain surveying. The T800 is, of course, standard equipped with 802.11 ac Wi-Fi IEEE 802.11 a/b/g/n-compatible and Bluetooth, and offers additional optional Gobi mobile broadband and GPS. For vehicle deployments, configure the T800 with tri-pass through antenna ports, allowing you to simultaneously connect high-gain GPS, WWAN and Wi-Fi roof-mounted antennas.